First things first, the name. What’s the name of this film again? I’ve checked 6 times and I still can’t remember. I told a friend I was seeing a screening and felt embarrassed that I couldn’t remember what I was seeing. Describing it, she knew the one, she’d seen the posters all over New York on a recent trip, but she couldn’t call it to mind either. Let’s blame Darcey Bell, the author of the film’s novel source material for this and move on, the film itself is way more memorable than its title. The plot of A Simple Favour is that of a comedy thriller – a field less ploughed. It shares DNA with Gone Girl, but crucially doesn’t take itself at all seriously. From Paul Feig, the director of Bridesmaids, it doesn’t boast the same calibre of comedy chops, but contains a higher than average quota of laugh out loud one-liners. ASF has missing women, gaslighting, dark secrets, double crosses, betrayal and twists upon implausible twists, as this slightly shonky mystery unfolds. The film’s greatest strength is by far its two leads. Anna Kendrick plays to type as Stephanie, a saintly stay-at-home Mum. She’s a latter-day Stepford wife with a vlog and a nutri-bullet. Kendrick plays the part of normal-Mum-turned-amateur-sleuth to perfection. 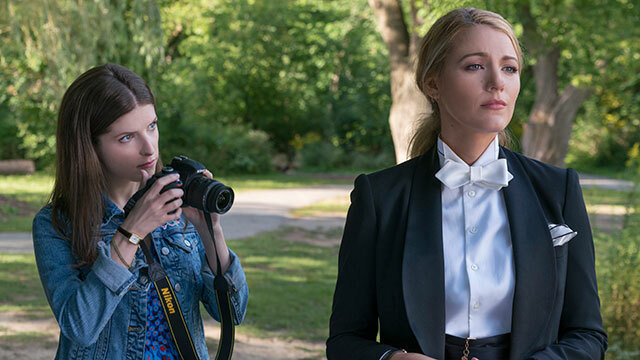 Blake Lively plays Emily, her polar opposite, a hard drinking, Louboutin wearing, fashion publicist who takes no prisoners. Lively comes to life in this hard-faced role and plays a much-needed counterpart to Kendrick’s saccharin sweet do-good mummy. Henry Golding, who plays Emily’s husband Dean, sadly lets the dream team down with his wooden acting. There’s no chemistry between him and anyone on screen. He’s the weak link in an otherwise excellent ensemble cast, which also features a stand-out performance from Lively’s surprising foul-mouthed and tiny son, Nicky, played by Ian Ho, who I’m sure we’ll be seeing a lot more of. The trick to enjoying A Simple Favour is not to think about / worry about / dwell on / even entertain its leaky plot, but ultimately this film knows exactly what it is: 117 mins of really good fun: a laugh-out-loud thriller romp, with sparkling leads and some genuinely unexpected moments.